During a compelling class on criminal organizations taught by Guillermo Trejo, at Duke University, I was struck by the complex consequences of criminal–and political–violence on civilian life. At the same time, I was enrolled in a course on social networks with Jim Moody, a wonderfully talented sociologist who convincingly situates network dynamics at the center of the human experience. By the end of the semester I was left with the question: how do networks moderate the effects of violence on civilian life? This question eventually led me to co-organize a national survey in Mexico in July 2012, with my colleague Sandra Ley Gutierrez, focusing on the consequences of criminal victimization. 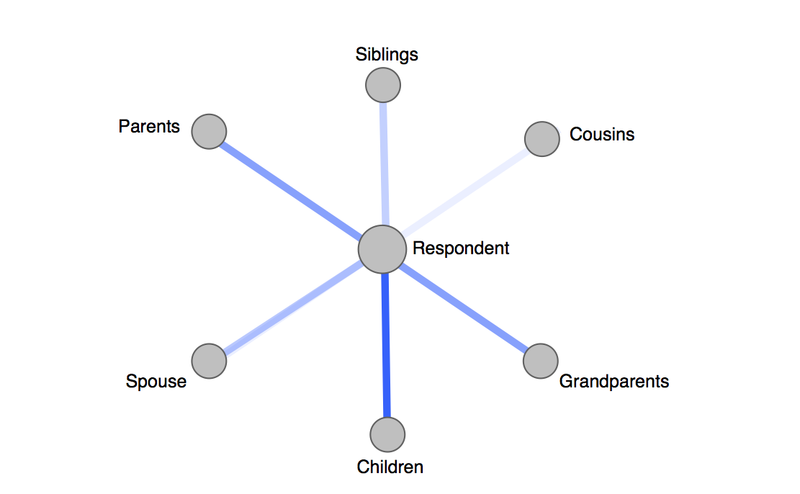 In this survey, I collected original data on 1,000 kinship networks as a way to capture social networks at the individual level. Studies on victimization have repeatedly reported that victimization is associated with an increase in political participation, but we don’t really understand why. I find that for self-identified victims, kinship connectiveness increases probability of participation in political party meetings by 5%, all else constant (when the other covariate values from my model are set at their mean or median). The size of this result is consistent with other studies on political participation which typically find effects under the 10% range. These predicted probabilities, of course, are contingent on the selected covariate values. Thus, let’s also review specific “real world” scenarios.